The first time I used my round loom for knitting, it was to make a collection of soft squishy beanies for a few kids I love. This time, I wanted to turn things around and knit a bag that I could use to hold my water, sunblock, and camera while out on a late-summer/early fall hike, or for collecting shells, driftwood and salty treasures at the beach. Since I’m on a budget, and wanted to knit a satchel durable enough to handle the great outdoors, I stole borrowed 2 bundles of jute cord from the garage, used my 8-inch diameter round loom, and 3.5mm straight bamboo knitting needles, and to complete my bag, I also used the plastic sewing needle that came with the loom kit, a wooden bead for my bag clasp, and a pair of scissors. 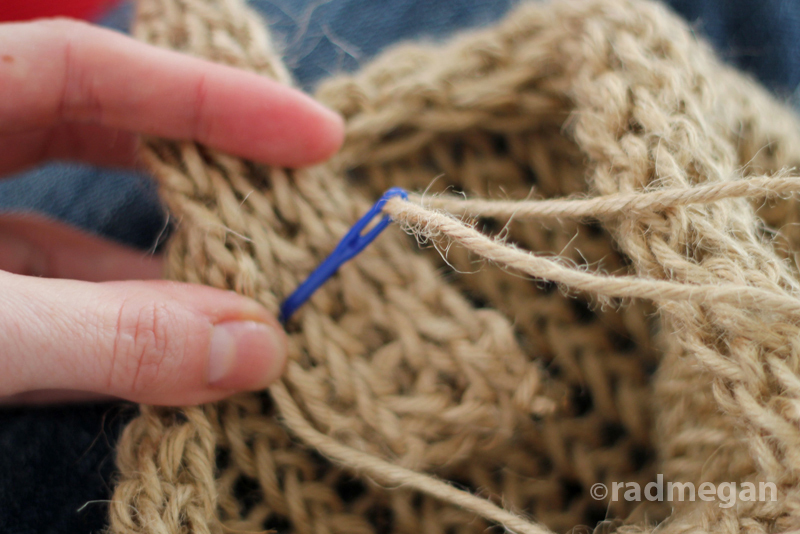 Casting onto straight needles is a bit different from casting onto a round loom. 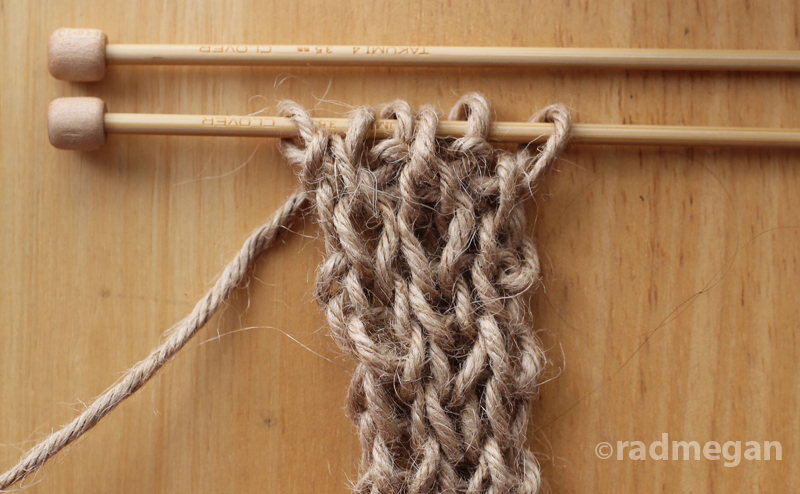 In my last loom-knitting post, I referenced these YouTube video for help casting on and casting off the loom. I still think they are extremely helpful if you have never cast on a loom before. Once you cast on the loom, you can basically keep on knitting until you reach the length of bag you want. 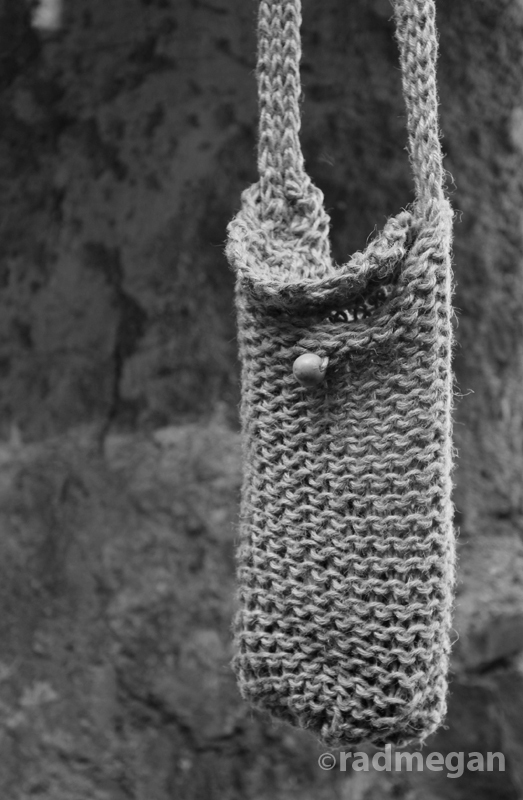 After knitting/purling about 30 rows, I cast off the loom, and set aside the now-finished sack portion of my purse. Once I had my strap done. I cast off the needles, and cast on another 16 stitches to make an outer flap for the bag, so that I could close and secure it. 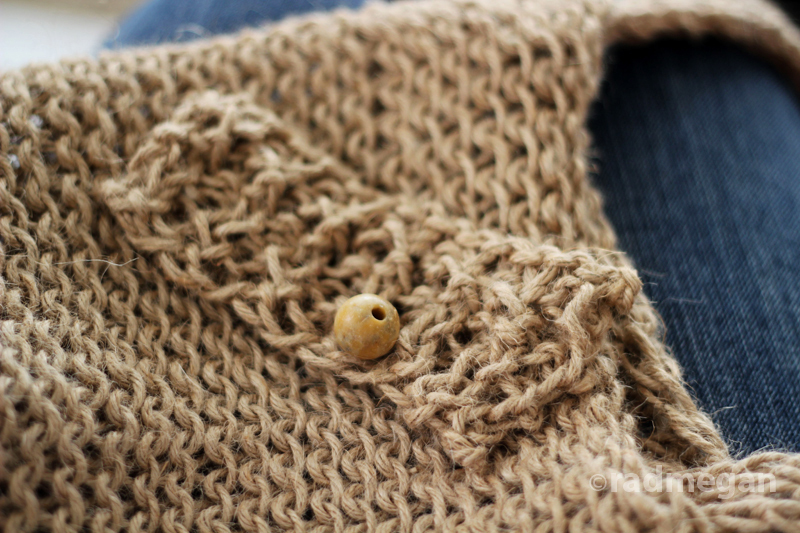 I knit/purled 12 rows, and dropped a stitch somewhere along the way (I’d like to say it was on purpose…) Since my little flap now had an open spot in the knitting, I grabbed a wooden bead that would fit through the hole, and decided to use my mistake as a make-shift button hole. 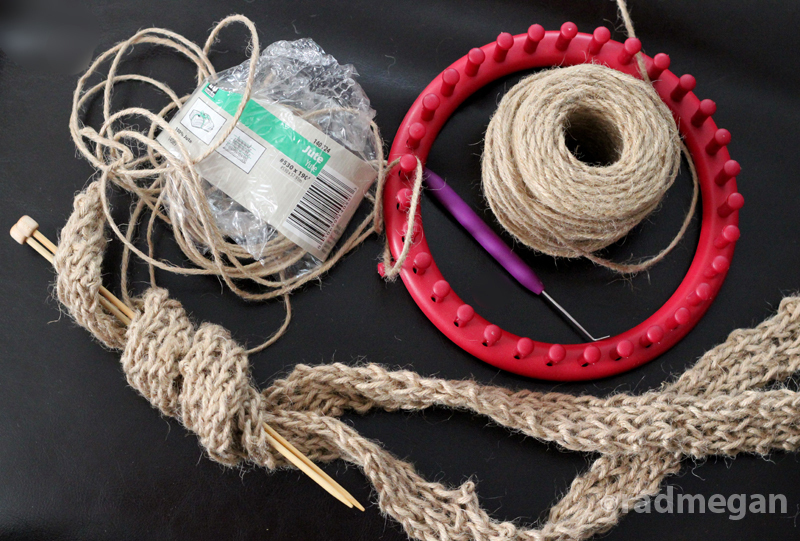 Using the plastic needle that came with the loom knitting kit, I used a few lengths of the extra jute fiber to attach the purse straps to the inside of the bag (if you find that your straps are too long, you can simply tuck more of your strap into the purse before you attaching it. I also sewed my flap to the top of one side of my purses opening, and then sewed in the wooden button when I knew where the hole would line up. When my bag was complete, I was immediately pleased with it! 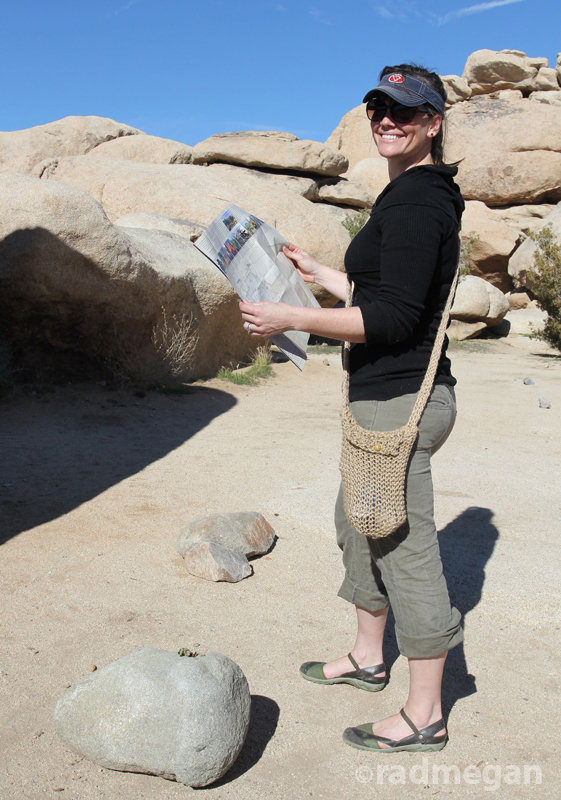 It’s sturdy enough with the jute fibers, that it can handle desert hikes, and beachy days, and since it’s knitted, sand and dirt sift right out of this bag, and if I’m carrying a water-bottle with a lose cap, there’s no problem if the bag gets a little wet! I’ve already started my next outdoor bag out of cotton cord, since I like the durability of this bag so much. Perhaps I can come up with a design manly enough for my husband to want to wear one while we are out in the wild- so I won’t have to carry his stuff too! 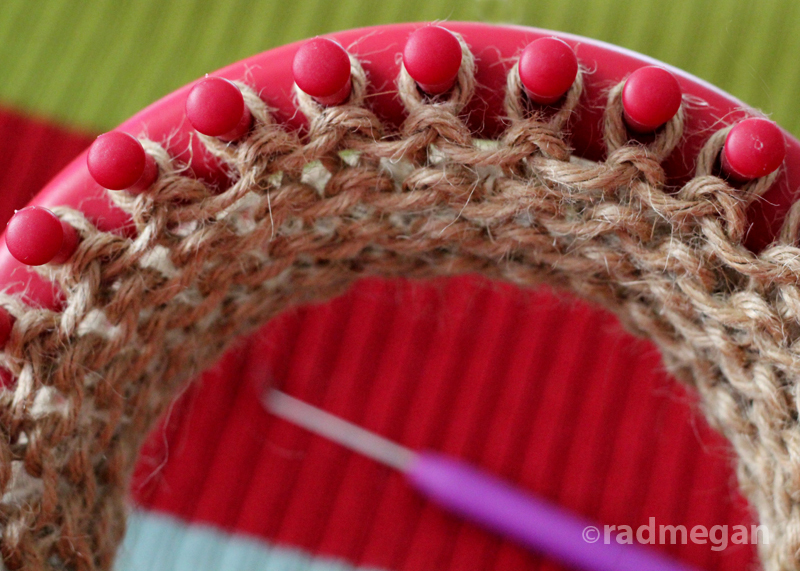 Love it and LOVE loom knitting! Cant wait to see if you come up with a manly version cause I hate carrying the boyfriends stuff on hikes too! 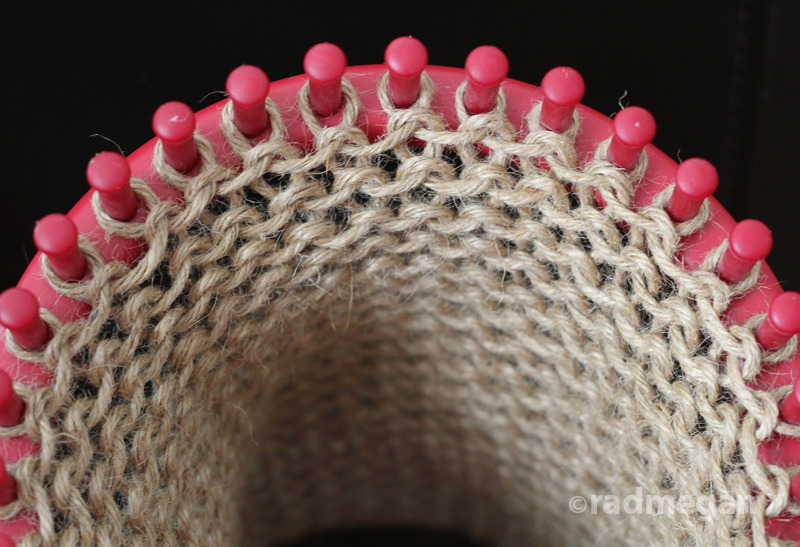 I might try making a water bottle cozy with a loom for hikes too. Thanks! First, I LOVE them shoes! what are they? Second, did you JUST make this and then go to Joshua Tree? Third, we sooo need to figure out a camping weekend (Jeff has been pining for a camping adventure since our banh mi day)! Thank you Shivy! I’ll be sure to keep you posted! Haha Lora- I love it! Jek- No I wish!! I made it before we went to Europe! The shoes are Tevas- soooo comfy- thank you! I’m totally game for a camping weekend. Lets get out our calendars lady! I love it! Can you make me a laptop bag like that??? About those adorable shoes…Where did you get them and what are they called???? Oh, and I love the bag too, but about the shoes???? Thanks for following Lovely Light! South Africa! Delightful! Wow! Great idea! You did inspire me to create my own pattern for a bag and cell phone case, so I will give you credit on my blog when I put it up! Once I post it, I will send you the link! Thank you very much! I pinned this a long time ago but am just now really looking at it. I wonder if, since you made this, you’ve made another? I am going to have a go at it, but I think I will make the flap one piece with the piece on the loom. I’ll likely make the handle on the loom as well, but still a separate piece unless I can sort out how to do it all in one. It would still have at least one seam, but it might be doable. that’s outstanding story. really i am inspire it. keep doing this great job. thanks for sharing your story. 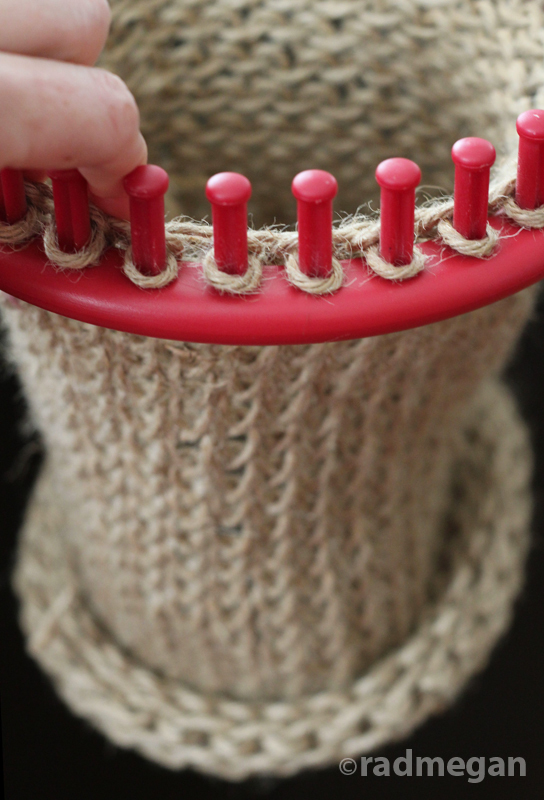 Hi, I was directed here through one of my pins on Pinterest, and I saw you created the handle on straight knitting needles, but I’ve also seen designs which utilize the knitting loom to make a strap for bags too, would you be able to do a tutorial on this as well? 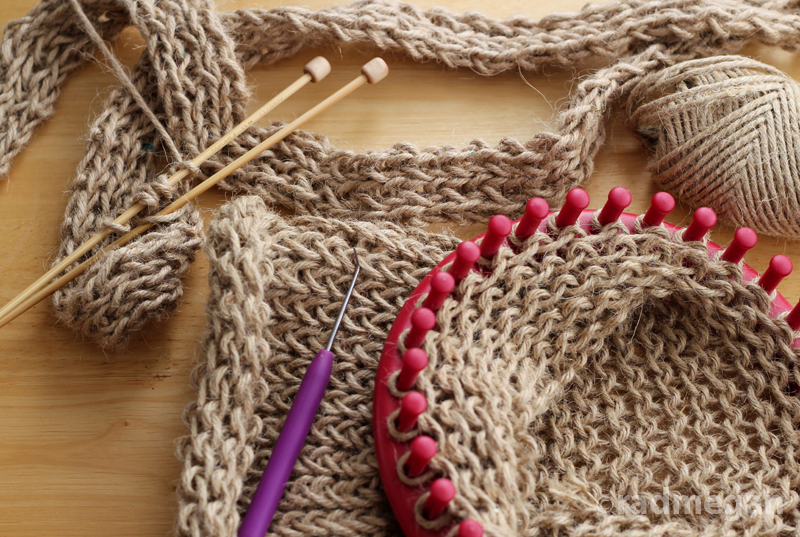 Knitting is my favorite hobby. When I’m free then I have to do it. Really, I’m glad to see this post. I have got some new idea which is helping me very much. Thanks for sharing this.